DERBY*GOKIT® was used to standardize components in all events shown on this page. 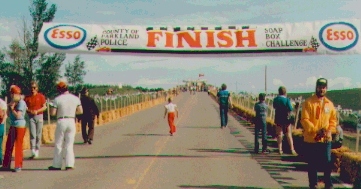 Service clubs, such as Kiwanis, Rotary and Kinsmen Clubs or police often sponsor races but because of the amount of work and organization involved, COMMUNITY and CORPORATE involvement is usually a desired and necessary part of a successful race. 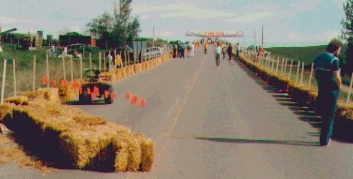 Local farmers may have straw or hay bales and machinery that can lay out hay bales for safety barriers along each side of the track prior to the race and then pick up the bales when the race is over. Farmers or local machinery sales companies might be willing to have their trailers used to haul the racers back up the hill after the race. 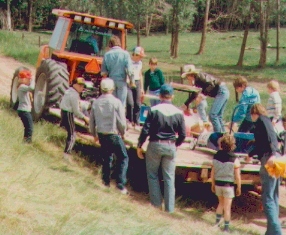 Another way adults in the community can become involved is by helping load racers on to the trailer at the bottom of the hill. 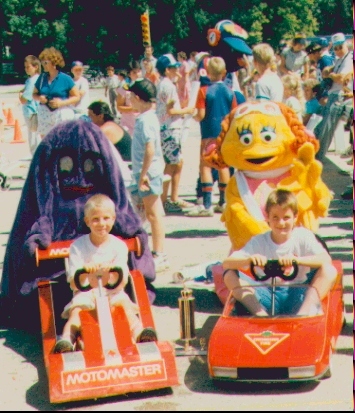 Sponsors may be willing to contribute necessary components for the track. 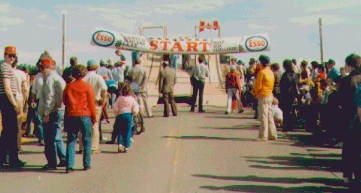 A local trucking company provided the flat bed trailers on which the ramps are fastened and moved them to the hill on race day. 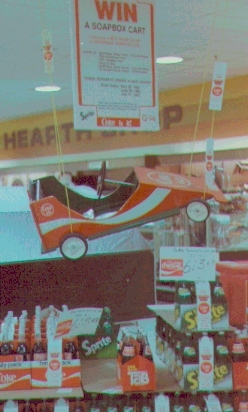 Ramps as elaborate as the ones shown below should not be necessary, but they allowed older kids to start at the top and younger kids a starting point lower down to control speed. Start and finish banners donated by sponsors benefit the organizers and racers. Everyone benefits because the organizers appreciate the banners and the sponsor appreciates the opportunity to let the community know it is a good corporate citizen. Other sponsors can provide color, entertainment and refreshments at the event. Many large corporations appreciate the opportunity to be associated with community youth groups. Cooperative advertising can raise the positive profile of the organizer's event as well as the image of the sponsor. Some organizers and/or participants have approached sponsors to purchase kits and entry fees on behalf of the participants. Service organizations can use the "entry fees" to support their favorite projects. If there are any photos that might be suitable to be added to this page, please feel free to submit suggestions, 75 dpi jpg image as an attached file or send a photo to the address on the home page. If the WebMaster considers it suitable, it will be included. To return to the home page, click "BACK" at the top of the screen or click on this sentence.